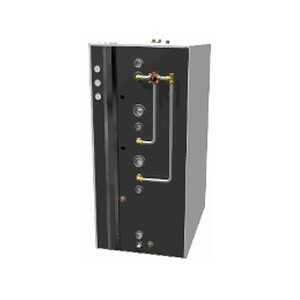 Storing energy to make firewood burning more convenientAqualux Teknik 750 To take advantage of all the benefits of a modern, environmentally approved firewood boiler, the excess energy produced by the boiler must be stored. This energy is then used to heat the building, even after the burning cycle has finished. Using an accumulator tank reduces the number of burning cycles, making it more convenient to use firewood as a fuel. If your electricity supplier offers differential electricity rates, it maybe worth storing heat in cheaper periods, then consuming it when electricity is more expensive. The large volume of the Aqualux 750 Teknik is used to store the heat from the solar collectors. The energy provided by the sun rarely matches the pattern of use, allowing the accumulator can “save” the heat and release it more slowly over a longer period, for example overnight. A solar collector needs 15-50 gallons of water per 10 sq feet, so up to 160 sq feet of solar collectors can be connected to the Aqualux 750 Teknik. Aqualux 750 Teknik is designed to work as a stratified tank. Warm water is less dense than cold water, so it floats on top of cold water. The stratification properties of water are used in order to maximise the storage capacity of the tank and to optimise the operating conditions of solar collectors and heat pumps. Solar collectors and heat pumps work more efficiently and the hot water capacity increases if water is well stratified in the tank. The thermal stratification plates and diffusers in the Aqualux 750 Teknik create and reinforce stratification between cooler and warmer water. The temperatures inside the tank can be easily monitored using the three thermometers on the front of the tank – temperatures are measured at the top, in the middle and at the bottom. The Aqualux 750 Teknik has a copper-lined water heater, a solar coil and openings for two immersion heaters. There are thermometers for the top, middle and bottom temperatures. The position of the immersion heaters depends on the hot water requirement. If the immersion heater is installed in the upper opening, the hot water capacity is lower than if it is installed in the lower opening. If immersion heaters will be used for heating, the number of units and the size are based on the power requirement of the property.